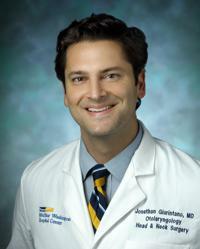 Jonathan Giurintano, MD, is a board-certified otolaryngologist at MedStar Washington Hospital Center and MedStar Georgetown University Hospital. A diplomate of the American Board of Otolaryngology – Head and Neck Surgery, he is also a member of the American Academy of Otolaryngology – Head and Neck Surgery, the American Head and Neck Society, the American College of Surgeons, and the American Society of Clinical Oncology. Dr. Giurintano treats benign and malignant diseases of the head and neck, with a special focus on head and neck cancer surgery, anterior skull base surgery, and microvascular reconstruction. As a specialty-trained head and neck cancer surgeon, Dr. Giurintano forms part of a multidisciplinary team that offers tailored treatment to patients diagnosed with tumors of the head and neck. He is trained to work alongside neurosurgeons to access tumors of the anterior cranial fossa (pituitary region) through the nose using minimally invasive endoscopic techniques. He is also trained in the reconstruction of head and neck surgical defects using local, regional, and microvascular “free” flap techniques. Additionally, he is trained in using sialendoscopy for the minimally invasive removal of stones from the salivary ducts and robotic surgery for tumors located in the back of the throat and voice box. His clinical interests include the reconstruction of complex defects created by the removal of cancers from the head and neck, accessing tumors of the parapharyngeal space, and exploring new corridors for endoscopic approaches to the skull base. His research interests include speech and swallowing outcomes after treatment of oropharyngeal cancer using transoral robotic surgery (TORS), and investigating options for reconstructing post-operative skull base defects. Dr. Giurintano received his medical degree from the University of Mississippi School of Medicine. He then completed internship and residency training in Otolaryngology – Head and Neck Surgery at the University of Tennessee Health Science Center, where as a chief resident he was inducted into the Alpha Omega Alpha Honor Medical Society. Finally, he completed a one-year fellowship in head and neck surgical oncology, anterior skull base surgery, and microvascular reconstruction at the University of California – San Francisco Medical Center. Dr. Giurintano has participated in international humanitarian trips, traveling to Migori, Kenya with the Kenya Relief organization to offer medical aid. He has presented both oral and poster presentations at numerous national conferences, and he has authored multiple peer-reviewed journal articles and book chapters. Dr. Giurintano is dedicated to providing comprehensive surgical care of the head and neck, and he is excited to bring an innovative skill set to the Washington, DC, region. He values the use of minimally invasive techniques when possible in order to minimize operative morbidity, decrease hospital length of stay, and increase patient quality of life in the post-operative period. He is passionate about working closely with his colleagues in the Departments of Otolaryngology – Head and Neck Surgery, Medical Oncology, and Radiation Oncology at MedStar in a multidisciplinary setting so that his patients can receive the highest quality of care from a team of trained experts. Dr. Giurintano is accepting all patients who require a higher level of care for disorders of the head and neck, including advanced head and neck cancers, as well as patients who require reconstruction of defects caused by the removal of head and neck cancers. “My philosophy of care follows the teaching ‘cura personalis’ (care of the whole person). When patients are diagnosed with head or neck cancer, it’s a life changing diagnosis, one that can often alter their physical appearance as well as the ability to eat, speak, and breathe. A diagnosis of head and neck cancer can drastically affect a patient’s ability to enjoy the seemingly most basic activities – such as eating at a restaurant with family and friends. My goal as a surgeon is to not only achieve an optimal oncologic result, but to provide an optimal functional result so that my patients can return to their pre-cancer quality of life as closely as possible.